Bryant Heat Pumps come in three different model lines - the Legacy, the Preferred, and the Evolution. Each class is excellent in their own right and perfect for heating and cooling your home or business. Check out the best models, the most advanced features, benefits and more. All of the Bryant Heat Pumps have several items in common such as the environmentally friendly Puron as the refrigerant. Puron is important because unlike older refrigerants, it does not deplete the ozone layer and so it is better for the environment while not sacrificing efficiency. All models come with a 10 year warranty on parts. This ensures that you are covered in case of part failure and also demonstrates the high quality standards that Bryant puts into every heat pump they make. Every single model of heat pump is also quiet at their low settings, some even as low as 58 decibels, thanks to an exclusive AeroQuiet system II design. This is great as it means that you do not need to choose between cooling your home and hearing your TV. With some of the quietest heat pumps on the market, you can enjoy the peace and comfort that a new HVAC unit will bring. The Legacy series is the most affordable of all of the Bryant heat pumps available. They are smaller units than the Evolution or some of the Preferred but are ideal for use in small homes or those desiring maximum comfort with minimum price. All units in this series also come with a Wi-Fi compatible thermostat so you can change the temperature of your home anywhere you happen to be or even adjust it on your way home from work so your home is nice and cool when you get there. This is ideal as it saves you money by not having to maintain a temperature or trust timers or auto settings. Perfect for small homes wanting to improve their heating and cooling efficiency, some of the models in this line like the 215B even are compatible with hybrid heat so yours new HVAC can work together with an existing gas furnace. The Preferred series of Bryant heat pumps is the next class up from the Legacy and offers more versatility than the smaller Legacy line. Some models in the Preferred line like the compact heat pump 538B can be placed nearer to homes - as close as 6 inches in places where space is at a premium. Also this same model can be stacked on top of one another in a multi-housing situation. Models in the Preferred series also have the remote access abilities like the Legacy allowing adjustment from anywhere. This line also works at a greater energy efficiency level as well with the 226A having a HSPF rating of up to 9.5. The versatility, flexibility, efficiency, and greater power of the Preferred series makes it a great compromise between features, efficiency, and price. When it comes to sheer size, power, features, efficiency, cooling and heating ability, and utility savings, there is no other model series that can offer it as well as the Evolution series. With models like the 280A reaching a HSPF rating of up to 13 and a SEER rating of up to 20.5, models in this class are highly efficient and ideal for larger areas. With a capacity of up to 2-5 tons they are able of heating and cooling larger buildings, offices, or spacious homes. The HVAC models in this line also boast the most advanced thermostat Bryant offers, the Evolution Connex. This is not your ordinary thermostat; with the intelligent ability to designate zones, it can work maintain even heating or cooling throughout your home or office. One of the other features that defines the brand is that all of the two-stage or variable speed models feature advanced dehumidification. You can monitor and help control the humidity via the Evolution Connex thermostat. Lowering humidity not only improves comfort but health as well. 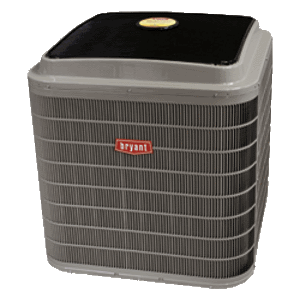 So whether you need to cool a single home or the office, Bryant heat pumps are some of the best HVAC units on the market. Versatile, efficient, power saving, environmentally friendly, and above all reliable, Bryant heat pumps are the ideal choice for anyone who wants to save money and enjoy the heating and cooling comforts of their own home.